This web site is designed to give you a little background on the office, staff and what we offer for you and your family’s dental health. 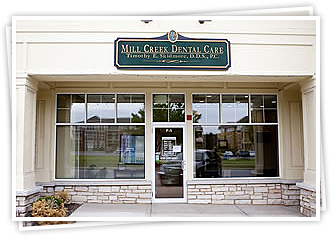 Mill Creek Dental Care is located in Geneva, Il. At Mill Creek Dental care we strive to provide you with the best dental care available. To do this we first listen to you and your questions to see what your needs are. The latest technologies are employed to keep your health and safety as primary concerns. Our goal is to guide you to optimal oral health with the least invasive treatment possible. Just because technology and innovation make something possible does not make it necessary or appropriate for everyone. We hope to make your dental experience a great one, if you have any questions or would like to make an appointment please contact us. Our office is located at 39W250 Herrington Blvd., Geneva, IL 60134. Call us at (630) 208-0051. Dr. Skidmore is excited to offer his skills and passion for dentistry to the residents of Mill Creek and the Fox River valley. We are very proud of our facilities here at the Mill Creek Village Center. Comfort and Dentistry can exist in the same location. Come see how we can provide that for you and your family. Please call or email with any questions you may have. We are happy to help you in any way we can.